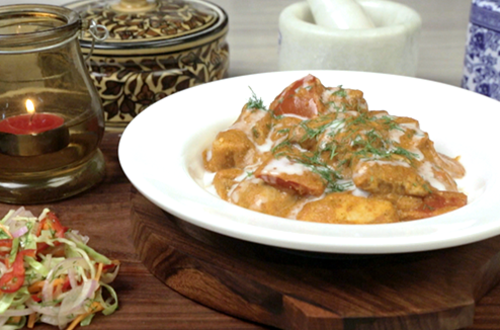 A mouth watering dish made with marinated chicken cubes and Indian spices to give it a delicious flavour. 1 Marinate the chicken with red chilli powder, lemon juice, a portion of ginger garlic paste, yoghurt and coriander powder. Set aside for 1-2 hours. 2 Pre-heat the oven to 200 degrees C and put the marinated chicken in the oven for 15 minutes. 3 To make Makhani gravy, heat 1 tsp oil in non-stick pan. 4 Add remaining ginger-garlic paste and sauté for two minutes. 5 Add tomato puree and Knorr Chef’s Chicken Masala to the pan. 6 Add 1 cup (150ml) water. 7 Bring the mixture to boil reduce the heat and add honey. 8 Add the marinated cooked chicken pieces and kasoori methi powder. 10 Simmer for 5 mins and garnish with chopped coriander leaves.